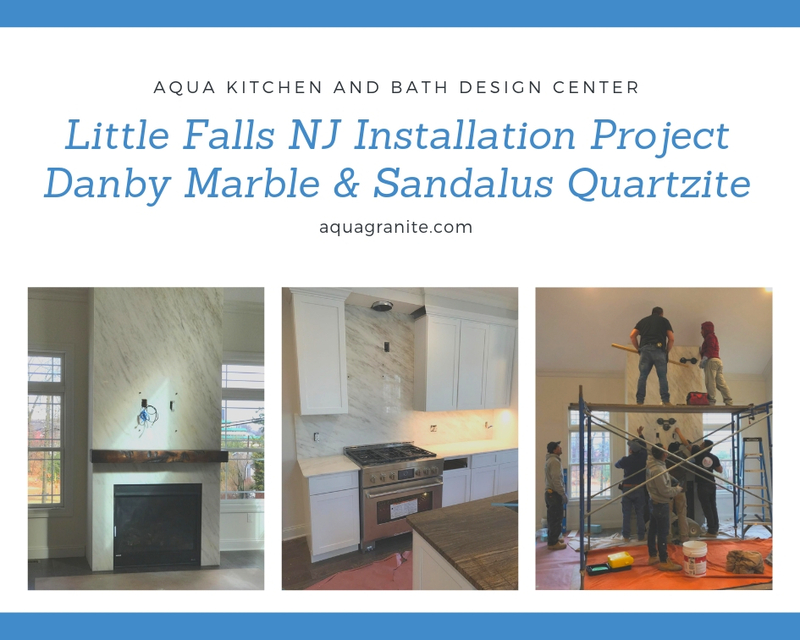 Danby Marble fireplace and Sandalus countertop island installation in Little Falls, NJ is the latest project Aqua Kitchen and Bath Design Center team has completed. This beautiful family home got a stunning makeover with the most prestigious white marble and exotic quartzite of timeless beauty. This township located in Passaic County, New Jersey, is primarily residential. Little Falls has a strategic, prime location in the tri-state metropolitan area — Newark Liberty Airport is only 12 miles away from it while New York is just 15 miles away. At the same time, Little Falls is a town in NJ that is quiet and has a warm, small town feel that is perfect for everyone who is looking for a tranquil way of living but still wants to be close to all major sites and localities, whether for work or fun. Little Falls is crisscrossed by several major roadways, including New Jersey Route 23 and U.S. Route 46. Interstate 80 and the Garden State Parkway are also near the township. Also, there are many crossings in the town of the Upper Passaic River. Little Falls, NJ offers a plethora of services located within a walking distance and many local shopping options. Little Falls Township Public Schools educate kindergarten children through eighth-grade students. Passaic Valley Regional High School located in Little Falls NJ, also serving students from Woodland Park and Totowa, educates ninth through twelfth grades. Also, most of Montclair State University is Little Falls-based. Tracing its heritage back to 1711, Little Falls NJ is now home to about 15 thousand people. Most local commercial activity includes office-based companies, light industrial, and some heavy industry. Regular and convenient bus and rail service makes it possible for the many residents of Little Falls NJ to commute on a daily basis and work in New York and elsewhere. Stunning white background and gorgeous medium to strong gray diagonal veining characterize Danby White marble. Mined from the Brook Layer of the Danby Quarry, Vermont, Danby marble is very similar to Calacatta marble because of some of its cream and gold spots and specks. However, Danby white marble is much denser than Calacatta marble and therefore is less likely to stain and easier to maintain. Also, it’s less expensive than Calacatta. Aqua Kitchen and Bath Design Center team installed Danby White marble fireplace, kitchen countertops, and full height backsplash. Fireplaces look best when covered in marble. An amazing range of patterns, textures, and colors can fit various aesthetics, interior styles, and budgets. Danby White marble was perfect for this Little Falls NJ home. Aqua Kitchen and Bath Design center team installed this Danby white marble fireplace 15′ high, adding a little old-world pizazz to the room. When homeowners decided on Danby White marble, it was pure enjoyment for our team to install it. The job was a pure pleasure for our crew. 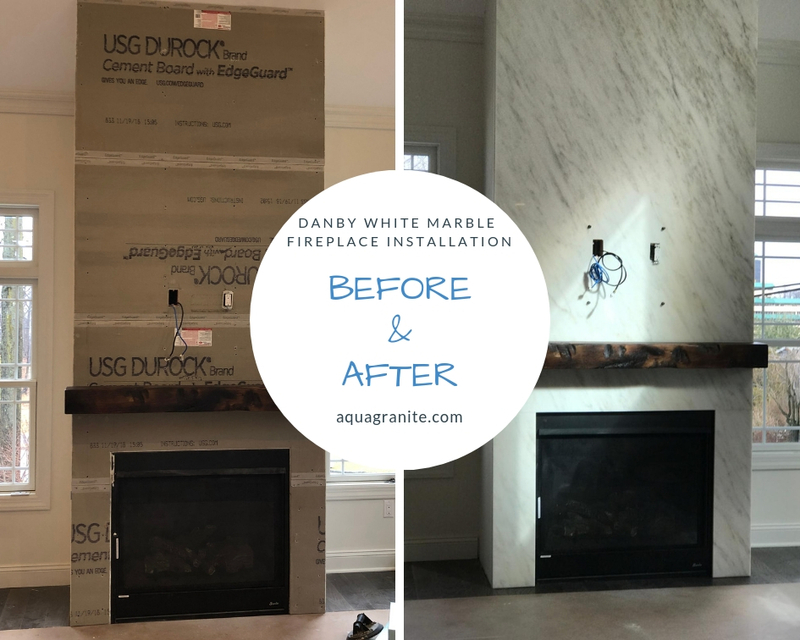 Whether you are planning to restore and update an old fireplace or build a completely new fireplace, Danby White marble will give it a contemporary but timeless look. This marble will stand the test of time, guaranteed. 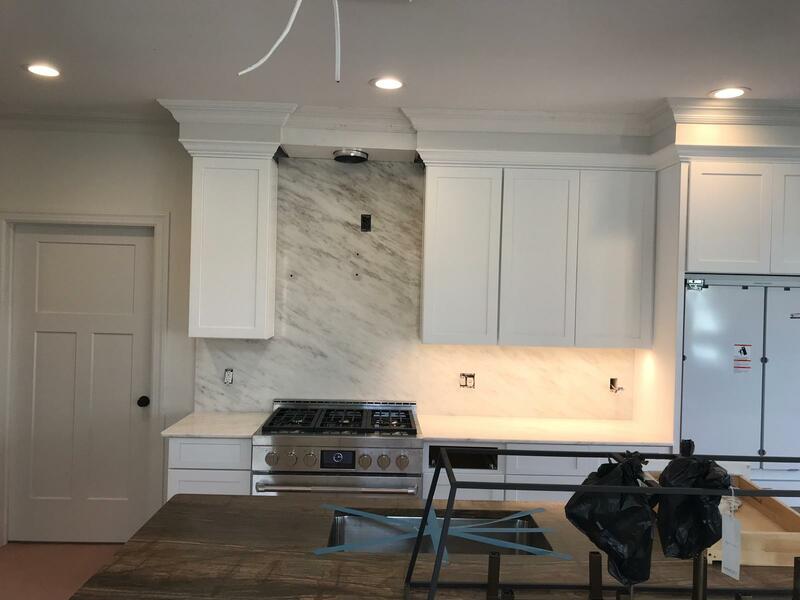 To provide the best look and top-notch value for their kitchen, and also to tie the kitchen design to the rest of their home, this homeowner in Little Falls NJ chose Danby White Marble for the countertops, as well as for the backsplash. Aqua Kitchen and Bath Design Center team installed this magnificent marble to the kitchen perimeter countertops and full height kitchen backsplash. Many homeowners who installed this remarkable natural stone in their home say that it was one of the best decisions they made. We are certain this homeowner will enjoy the new look and improved functionality in their kitchen. If you’re taken by the marble lust, you’ll be happy to find out that Danby White Marble is more durable and easier to maintain than regular marble. With fascinating gray veining and perfectly white background, it is especially effective when paired with white cabinets. Nothing is more modern, clean, and sophisticated than this winning combination. Danby Marble is a pure white natural stone that features mostly gray but also gold veining. Quarried from a recrystallized calcitic non-foliated metamorphic rock in Rutland County, Green Mountains, Vermont, U.S. Great for both interior and exterior use, for wall and floor applications, Danby Marble is very durable, resistant, and easy to maintain. Danby White Marble has Compressive Strength Psi 9475, Abrasion Resistance, Hardness 12.1, Flexural Strength 1226, Modulus of Rupture, psi 1077, and Density, Lbs/CuFt 169.2. These characteristics make it a safe, cost-effective, and beautiful choice for any home. Danby White Marble tied perfectly the kitchen to the rest of this home located in Little Falls, NJ. Anyone who likes to mix and match different types of natural stones will be amazed by how ravishing Danby White Marble and Sandalus Quartzite look together in this kitchen. The pristine appearance of Danby Marble and the exotic presence of Sandalus Quartzite not only complete each other but also create a subtle and very effective contrast. Sandalus is an uncommon, extraordinary looking quartzite stone. It is a remarkable stone that should be seen and experienced in person. Its timeless beauty comes from calming gray background and deep, golden brown shades and veining that radiate and overflow the whole room. A time-honored, durable, and gorgeous choice for any indoor applications, Sandalus Quartzite looks perfect. Just as it does on this kitchen island countertop in Little Falls NJ kitchen. Quarried in Brazil, Sandalus Quartzite gives out the natural but unusual look with its artistic combination of white, orange, gray, brown, and black shades. Its unique texture and leathered finish bring out an extraordinary depth that not many stones can offer. 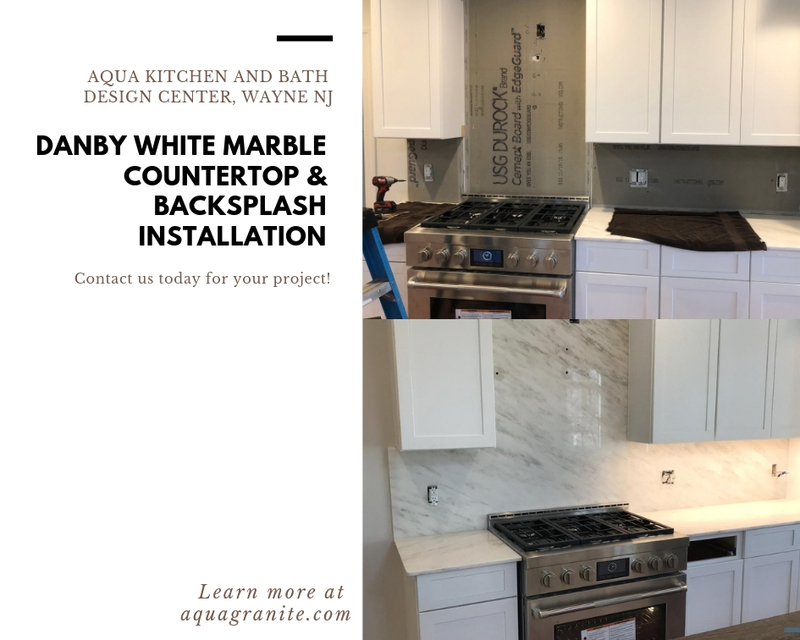 Aqua Kitchen and Bath Design Center in Wayne NJ offers many beautiful granite, quartz, marble, and quartzite options for your kitchen and bath countertops, and other applications. Explore our granite countertops, quartz countertops, and kitchen cabinets, and get inspired for your next project. When you choose your perfect countertop material and style, we will schedule your template appointment in 2-3 business days. Then, our expert designer will measure your countertops, complete the templating, and provide an expert 3D design. You can work with us and customize it any way you like. We will complete the fabrication in our facility. After the templating is done, our expert crew will install the countertops at your home. Aqua Kitchen and Bath Design Center team has a vast experience in commercial and residential, big and small projects. We are proud of our rich portfolio and perfect feedback from our customers. Take a look at some of the projects we completed at Avora Living Port Imperial in Weehawken, NJ, Quarry Place Tuckahoe, NY, and Forevermark Cabinets and MSI Quartz Installation in Jersey City. We are sure that our large and comfortable showroom located at 1107 Rt 23 South, Wayne, NJ 07470 will give you plenty of options to choose from. You will also easily get inspired for your next residential or commercial project. Our experts believe that every space, no matter how big or small, should be perfect for the people who use it. To start working on your dream kitchen or bathroom, contact us today and get a free estimate fast.